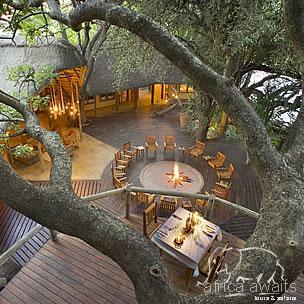 Susuwe Island Lodge offers visitors the opportunity to experience closely a wild and untouched island of Africa. Situated in north-eastern Namibia, our island is in the remote Kwando River - a permanent water source which nourishes delicate ecosystems and sustains varied game and birdlife. Susuwe Island Lodge is built to incorporate the riverine forest - the main complex has lofty canopy viewing decks overlooking endless savannahs, glistening lily-studded wetlands and ancient Kalahari woodlands, as well as a firepit, spacious lounge and dining areas, curio shop and small reference library. Six spacious brick and thatch suites equipped with double bathroom, bedroom, lounge and wooden viewing deck each with private plunge pool offer our visitors the opportunity to merge unhurriedly with Africa's timeless evolution of hazy days and star-studded nights. Mosquito nets, overhead fans and hairdryers as well as generated electricity are provided. Susuwe game drives in open 4 x 4 vehicles in the Bwabwata National Park. Game sightings in this cradle of rivers could include vast herds of roaming elephant and buffalo, lion, hippo, leopard, sable, roan, lechwe and puku for example. 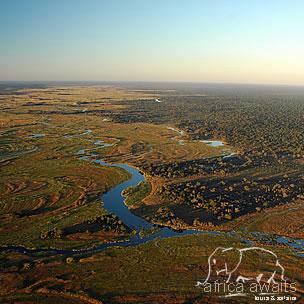 Night drives at Susuwe offer an even closer insight into the intrigue of the African bush. Outstanding bird watching in this area in a variety of riverine, floodplain and grassland habitats. Boating, nature walks and picnics or infinite relaxation in the cool respite of Susuwe Island Lodge are all possible. Dining is al-fresco style in a variety of romantic settings under the baobab canopy - or perhaps a picnic on a wild island. The chef can cater for any special dietary requirements. Susuwe offer a fully stocked bar and are proud of their comprehensive range of South African wines-rarely seen in such remote destinations!. Susuwe romantically caters for special occasions such as honeymoons, anniversaries and birthdays. Guests are surprised with moonlight dinners on a river sandbank, a private candlelit dinner for 2 on your own deck or a champagne brunch at the historical baobab. 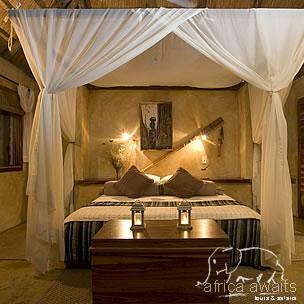 With your holiday, safari or business trip from in to Susuwe Island Lodge in Namibia.